The names of very few hotels evoke such fond, romantic images, and indeed such anticipation, as The Caravelle. Its breezy sound recalls its inspiration: the Iberian caravelas, or as the French called them, caravelles fast, light 15th-century sailing ships that explored the world in search of foreign trade, adventure and new horizons. And perhaps it’s no coincidence that Air France, which held a stake in the original building, and had its offices here since its opening, had also recently begun operating a fancy new jet airliner of the same name. The hotel’s modern design - the work of two architects, one French, one Vietnamese - and contemporary facilities soon had foreign embassies, news organisations and businesses moving in en masse. 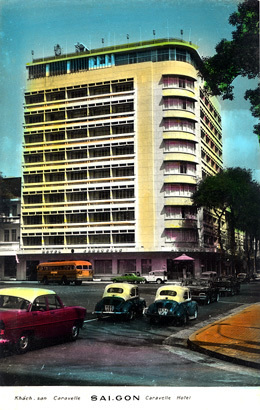 During the 1960s The Caravelle was home to the Australian Embassy, the New Zealand Embassy, and the Saigon bureaus of, NBC, ABC and CBS, to name but a few. For the most part, the ambience at The Caravelle was one of relaxed conviviality. The rooftop bar was the centre of operations - both professional and social - for the international media. From their tenth-floor perch, cold beers in hand, journalists could, by the war’s closing days, see the front line from their bar stools. If things got lively enough, they would ride the elevator down to the lobby, take one of the hotel's swanky American limousines out into the field and be back in time for cocktails and note comparing. By the end of the war journalists claimed that they could cover the action without even leaving their bar stools. The one event that did rather sour the Caravelle’s otherwise languorous, laid back atmosphere came on the morning of August 25, 1964. At around 11:30 am a bomb exploded in room 514, on a floor occupied mostly by foreign journalists, who fortunately were all out on assignment. Nine rooms were damaged, windows were blown out of several cars parked in the street, and a number of people were injured. Luckily no-one was killed. 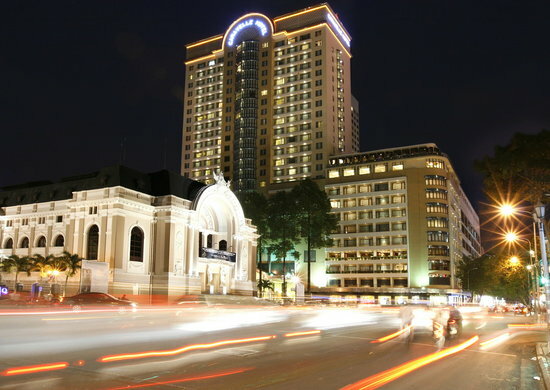 Following the Liberation of Saigon in 1975, the hotel was taken over and operated by the government and renamed the Doc Lap (Independence) Hotel. And so it remained until 1998, when the Caravelle name was relaunched, and what has once again become widely regarded as the city’s finest hotel was reopened - still, as before, intimate, welcoming and mercifully free of pretence. The original ten-storey building is now adjoined to a smart 24-storey tower that forms the bulk of the new property. Developers with less foresight might have been tempted to tear down the original and start from scratch. But somehow it seems unthinkable that those strikingly curved, balconied corners that have for almost half a century occupied one side of the city’s most picturesque squares, should be lost. The immediate views from that rooftop institution so beloved by foreign correspondents, and now called Saigon Saigon Bar, have changed little since 1959. If you look across the Opera House and the Hotel Continental and up along Dong Khoi Street, you can still see the twin spires of Notre Dame Cathedral. Along this thoroughfare - once called the rue Catinat - in 1975, a Vietnamese tank rolled down to the Place Garnier, now Lam Son Square. Pulling up opposite the Caravelle it is said to have turned turret and taken aim at the hotel’s facade. Why it didn’t fire is anyone’s guess, but rooftop tipplers with an appreciative eye for the heritage of this atmospheric corner of the city might consider raising a glass or two to whoever was giving the orders on that historic April afternoon.